It's been a little tough to focus on the day job when my phone is constantly going wild with news from SHOT Show 2015. A few friends, bunch of companies, YouTubers, and bloggers I follow are posting, texting and tweeting a ton of cool things that this lover of all things firearms finds more interesting than the tasks at hand. The news that has gotten most of my interest isn't a new gun or the next must have accessory. It is some news posted on the AK Operators Union, Local 47-74's Facebook page. 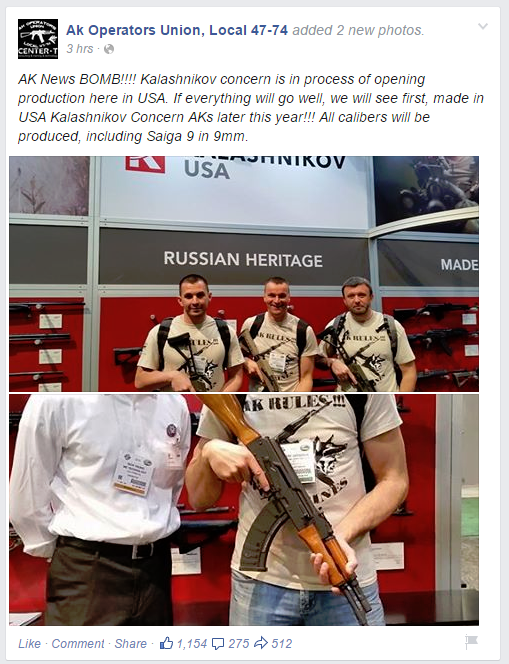 Kalashnikov Concern is in the process of starting production in the USA. While I may not be the biggest AK fan in the world, and there is a very good chance I'll never buy an AK from Kalashnikov Concern; I am jumping for joy that they are going to start producing their product in the USA. I think it is fantastic that the Russian company has found away around the import ban via Executive Order that was put in place in 2014. Let's not fool ourselves. The 2014 import ban was not really put in place to by our Federal Government as political sanctions against Russia for their invasion of the Ukraine's Crimean Peninsula. It was a gun ban vaguely disguise has political sanctions. If the our President truly wanted to pressure the Russian government with import restrictions, wouldn't he make much more of an impact by banning the import of vodka or other more widely imported Russian goods? The ban on import of Russian made firearms from Kalashnikov Concern was a well thought out move that made a statement to the Russians without too much risk to the White House for retaliatory sanctions that could escalate things quickly out of control. And with a stroke of a pen the President was able to ban at least the import of some of the style of firearms that many of his political party tried desperately to ban a few years ago. But now with Kalashnikov Concern setting up shop on US soil, this all changes. The Russian company will be able to sell it's product to it's US market, while providing jobs to Americans. Pretty interesting that the US is getting a lesson in Capitalism from Russia. If you are into AK's and haven't seen the AK Operators Union, Local 47-74 YouTube Channel yet, you should check them out. Besides having one of the most creative names out there for a gun channel, the have some very good videos to watch. Does Warped Humor = Russian Logic?